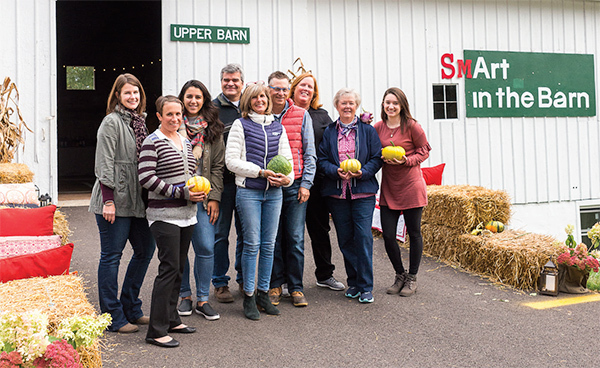 The Smart Farm to Table Dinner volunteers (from left) are Renee Blue, Emily Zack, Alexandra Sarkisian, Craig Mitchell, Kathy Gabelman, Andy Gabelman, Meg Mitchell, Kathy Phelan, and Kelsey Goldstein. Kathy Gabelman started Smart Farm from a vision that followed her mother’s death. Gabelman gathered friends, met a master gardener, and began growing in small plots at a community garden space offered by the Barrington Park District. Over time, the need for more space was inevitable. Advocate Good Shepherd Hospital offered land on its campus where Smart Farm began composting food scraps and expanded its farming area. Volunteers from the community showed up three days a week to help seed, plant, weed, and harvest. Each week during harvest season, they would yield a colorful pile of produce and transport it to local food pantries. As the harvest grew, so did the desire to share the spark that came with the new knowledge of local farming. Workshops and classes were offered for anyone who wanted to grow and cook beautiful, healthy food. Today, Smart Farm grows and donates close to 16,000 lbs. 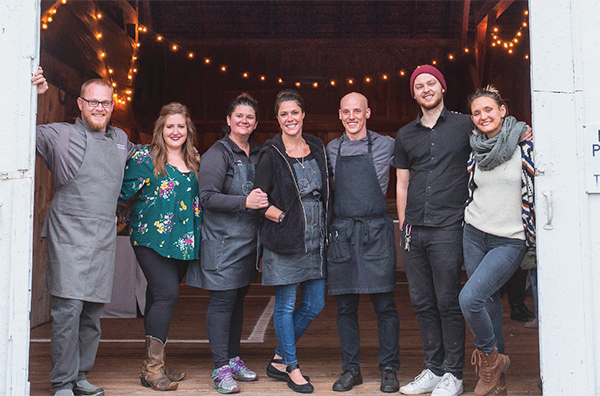 of produce each year, teaches workshops for children and adults, and hosts a farm-to-table fundraising dinner each fall with local chefs who spread the word about the importance of fresh, local food. Although the volunteer gardening focuses on a small geographic area, its cause is universal and essential—bright food for a healthy, sharing community. 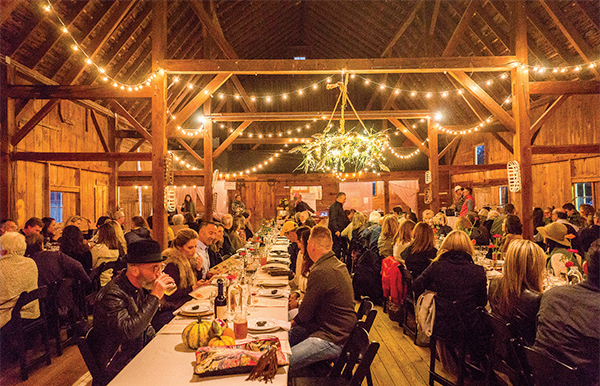 Preparing the farm-to-table meal at last year’s dinner are Mike Vaccarello and Meghan McGinty, Farmhouse on North; Rhienna McLain Trevino and Kathryn Bailey, 1776; Zak Dolezal, Dukes Ale House and Kitchen; and Alina and Jerry Jaskowiak, Pine Food Company. 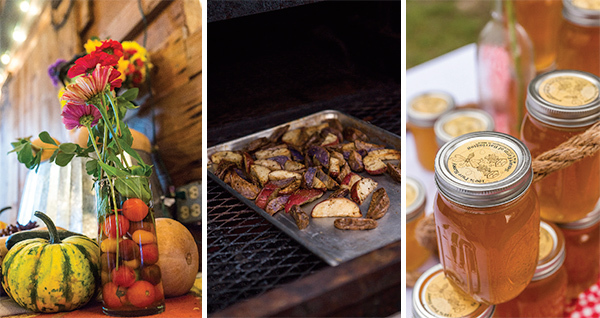 The next Smart Farm to Table dinner will be on Sept. 14, 2019. Renee Blue, co-founder of Mindful Waste, talks with Barrington 220 students at the Smart Farm garden. There are educational exhibits in the farmhouse offices that the students visited. 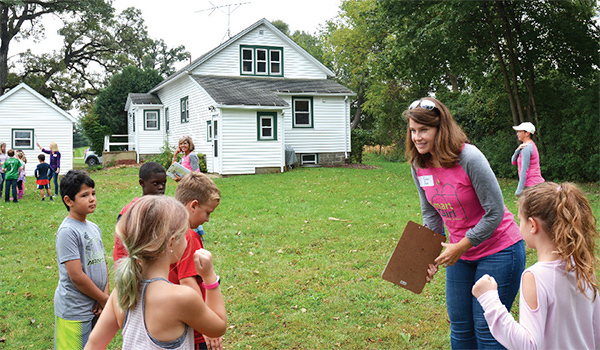 Last fall, students from Barrington 220 schools visited Smart Farm to learn about garden ecosystems, including soil, bugs, weeds, bees, and how to harvest vegetables. The farm is located off Rte. 22 to the west of Advocate Good Shepherd Hospital’s Barrington campus. Smart Farm welcomes all groups and individuals at its farm. Spring cleanup Saturdays begin on April 6 and open farm tours on Wednesdays in May from 12-1 p.m. For groups or workdays contact by email at: smartfarms2@gmail.com, or visit online at www.smartfarms.org.